Vilas County’s Trout Lake has a new invasive species. 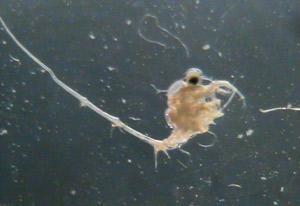 Spiny water fleas were found earlier this week by a fisherman who noticed them attached to his gear. Jake Walsh, PhD student at the UW Madison Center for Limnology, says the finding is significant because there aren’t many northern lakes that have the invasive.